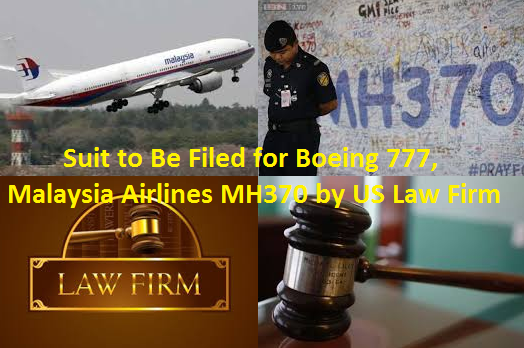 March 27, 2014; United States based law firm said they will file a lawsuit against the carriers and Boeing Co BA.N for alleging the plane MH370 had crashed due to mechanical failure. The MH370 is believed to have crashed in a remote part of the Indian Ocean that caused all its passengers including the crews with a total of 239 on board could have died. When this statement was given by the Prime Minister of Malaysia, there were so many reactions on the issue. With the aid of Inmarsat satellite system, the cause of the disappearance of the said jet is getting clearer. Though there are so many people who are so positive looking at the situation of the plane due to the fact that the search and rescue operation is getting closer to its solution, the families of the passengers on board could not accept the fact that their loved ones could have died. This is the issue that caught the concern of the Chicago-based Ribbeck Law. The said law firm is dedicated to knowing the reason behind the crashing, if this is so, of the plane. They will conduct investigation for possible reasons why the plane had crashed, if it is already proven that the signals received by the Inmarsat satellite is truly from the said missing jet. The firm is looking at the possibilities why the plane may have crashed and they are not convinced that there is a pilot suicide or hijacking. They have handled a case last July involving the Asiana Airlines Flight 214 wherein it crashed in San Francisco last July. Ribbeck represented the 115 passengers wherein their families cried for justice and it is most likely that the firm is set to represent half of the passengers of MH370. The firm is looking at a theory that the MH370 could have become a ghost plane, flying for a few hours until it ran out of fuel and crashed somewhere. They also suspect that a fire may have emerged due to a mechanical failure that caused all the passengers to become unconscious. Another thing is that there might be a problem in the fuselage that has something to do with pressure that caused the pilots to become unconscious also. The firm might file the case in US.The news based on ABS-CBN news.